Mirage 2000 is a low-set delta wing combat aircraft which is an extremely agile and manoeuvrable fighter developed for the French Air Force. The Mirage 2000 started its service life as an interceptor, designated 2000C and the two-seat trainer 2000B. 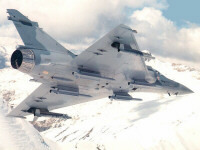 The 2000-5 is a multi-role variant capable of using the Super 530D or Sky Flash Air-to-Air Missiles. 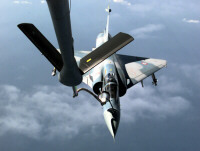 Initially ordered 37 Mirage 2000C by the French Air Force have been updated to 2000-5 standard, designated 2000-5F. Export models are designated 2000E for the single seat fighters and 2000ED for two-seat trainers and 2000ER for single seat recce variants. The Mirage 2000P (Penetration), later designated 2000N (Nuclear), is a low-altitude attack aircraft capable of delevering the ASMP tactical nuclear missile and was based on the Mirage 2000B two-seat trainer variant. It has a revised avionics suite and strengthened fuselage for the low-altitude role and the Antilope 5 nose radar, which is optimized for terrain following, ground mapping and navigation are has aditional air-to-air and air-to-sea modes. The rear seat is occupied by a WSO which has twin navigation systems and an additional moving map. The aircraft configurated with only the ASMP missile and 2 Magic AAMs is designated 2000N-K1, while the K2 configuration can also carry alternative loads. Developed from the 2000N-K2 is the Mirage 2000D, equipped with GPS it is developed for the use of laser guided weapons, but is not capable of carrying the ASMP missile. The 2000D-R1N1L is equipped with laser guided weapons and Magic AAMs only, while the R1 configuration can be equipped with the full range of conventional weapons. The R2 configuration is upgraded with a fully integrated self-defence suite and is compatible with the Apache stand-off weapons dispenser. The export model of the Mirage 2000D is designated 2000S, where the S stands for Strike. Dassault is now marketing the Mirage 2000-5 Mk.2 which will be built either as a new aircraft or retrofitted from currently operated Mirage 2000Cs or 2000Es. It features an integrated mission system with a glass cockpit, digital modular avionics and enhanced communications.